Steelhead fishing is considered as one of the more challenging sport fishing activities by many anglers. They aren’t as abundant as other fish species, and their elusive nature will test your fishing skills, knowledge and experience to their limits. But then again, this challenge is the very reason why this fish attracts certain anglers as they consider finding, hooking and landing a magnificent steelhead the ultimate fishing experience. If you’re looking to join this cult of “steelheaders” and bag this trophy of a fish, then we’ve got some tips on how to catch a steelhead right here for you. Pocket Waters. Pockets are the slack water that form behind or beside medium to large rocks strewn about in fast running rivers. Steelheads are known to hide in pocket waters especially during winter months when they are lethargic. Side Channels. These are well-defined and narrow bands of deep water that is surrounded by shallow waters. The depth and structure of such waters are preferred hiding places of steelheads as it makes them feel more secure. Also, these channels often serve as a highway for migrating fish like the steelheads. Migration Routes. Just like salmon, steelheads migrate for many miles from the open water back to their spawning grounds. However, unlike salmon, steelheads will not waste their energy fighting fast waters and battling rapids. They want to be able to get to their destination using the least amount of energy. So if you’re fishing for steelheads during migratory seasons, you want to find the route they take upstream. Current Seams. These refer to the boundaries between fast and slow water. The fast currents on one side of current seams are too fast for steelheads to hold, while the slower current on the other side of the seam is often too quiet for the steelhead to feel secure. Current seams provide a nice balance between disturbance and calmness for steelheads. Sandy Bottoms. Steelheads dislike sand mainly because it irritates their gills. That said, you’ll have a very small (if any at all) chance of catching this prized fish in such areas. If you’re travelling up or down the water and come across a sandy bottom, keep moving. Back Eddies. Many anglers agree that steelheads don’t hold in back eddies. And even if there are any steelheads there, it is highly unlikely that they will come out to bite your line that is floating in all weird directions as it is caught in the back eddie. Fishing rods come in a variety of types and designs. However, given the nature and behavior of steelheads, you’ll want to make sure that you arm yourself with the right fishing rod. There are several things to consider when it comes to choosing a rod for steelhead fishing. Fishing for steelheads will require a heavier and longer fishing rod since they allow you to make long, accurate casts into fishing spots where steelheads are holding. There are spinning and drift casting rods which are designed for these types of water, and those that have lengths between 8 and 10 feet have enough power and momentum to enable anglers to make precise casts. Steelheads are not very acrobatic, but they do give a good fight that will make most anglers break a sweat. When steelheads bite and the hook is set, this magnificent fish will fight desperately to escape, tearing up and down the rivers on long runs. That said, you want a rod with plenty of power (one with a medium- heavy rod power) to handle this relatively strong fish. As mentioned earlier, steelheads are generally strong, but they are often tentative when biting a lure. Sometimes, they’ll aggressively attack a line out of hunger, while at other times they’ll hit it so light and quick that many anglers usually don’t feel it. 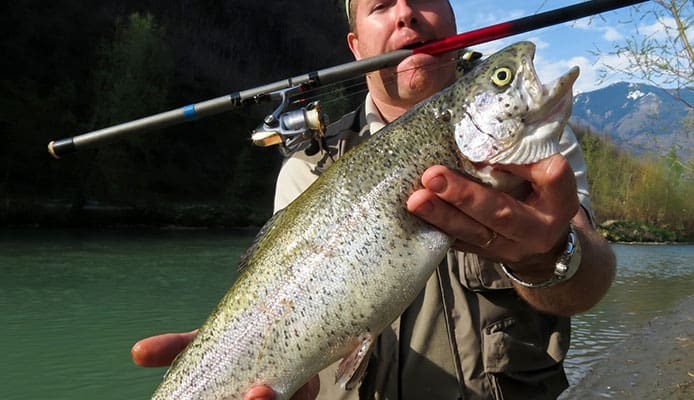 A fishing rod with a fast to extra-fast action will generally be sensitive enough for you to feel the steelhead bite. Anglers can employ a variety of techniques when it comes to steelhead fishing, and they’ve found that some of these techniques work better in certain conditions. That said, it would be a good idea to learn and practice several steelhead fishing techniques so you can always be ready no matter where and in what condition you decide to go fishing. This fishing technique is often employed by beginning steelhead anglers and those who are fishing from the banks. Here, a weighted jig or bait is tied below a floating bobber and drifted in the current. Compared to other fishing techniques, float fishing is relatively easy to learn and can be used in almost any type of water system where steelheads are found. Aside from being easy to learn, there’s also the excitement of seeing your bobber dive down which should mean that you’ve got a bite. One of the most effective steelhead fishing techniques is drift fishing which involves casting a bait upstream and allowing the bait to drift naturally downstream. Here, the bait or lure is bounced along the bottom with the help of a significant weight. The key is to keep the bait near the bottom of the water and drifting along at the same speed as the current. Despite being a difficult technique to master, it’s one of the most widely-used steelhead fishing techniques because of its effectiveness. If you are drift fishing, experts recommend using bait casting reels because they provide superior casting precision and control. Fly fishing is a challenging but rewarding technique for targeting steelhead. If you’re going to use this technique, you’ll want to use a 7- to 8-weight fly fishing rod and reel that provides the power needed to cast big flies and retrieve the powerful steelhead. A plug is a plastic lure designed to dive and wiggle in the current. While they are often pulled behind a boat where they can move and wiggle in the water as the boat drifts downstream, plugs also can be cast from the bank and slowly swung in the current. Although you can use almost any fishing rod for this technique, most experts would recommend that you go for specialty plug rod or hot shot rods with a sensitive tip and fast action. Losing a steelhead as a result of not using the right fishing line is more than frustrating. Needless to say, using the wrong line can throw off a whole day of fishing. Typically for steelhead, monofilament and fluorocarbon line are used, though some anglers do use braided lines at times. Regardless of the type of fishing line you use, always keep in mind that the color of the line is extremely important. Matching your leader to the water color will allow for an almost invisible line. For instance, when fishing in clear waters, using a clear monofilament is typical, whereas you’ll want to use a brown monofilament if the water is looking muddy and dirty. Obviously, a green monofilament works well in green tinted or mossy waters. As with any other fishing activities, selecting the correct type of fishing line is important. If you’re using a line with little to no stretch, chances are that hooks can be straightened or knots broken. 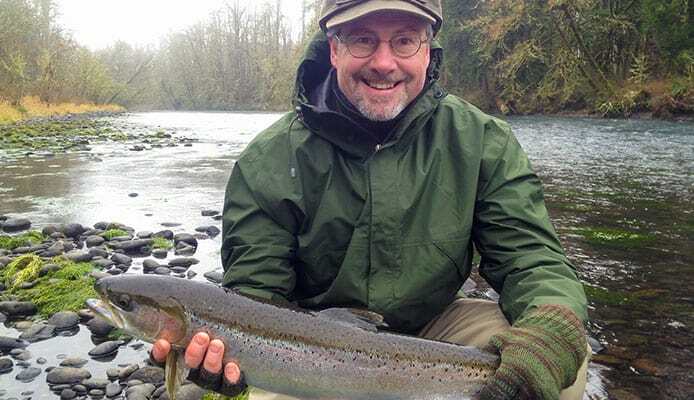 On the other hand, if the line is to light for a strong fish like the steelhead, it can happen that the line will snap and your steelhead will be swimming away smirking. Fish egg sacs are probably the most effective type of bait you can use when fishing for steelheads. Steelheads generally consider these as a delicacy, and will be honing in on this tasty meal any time it is presented to them. Jigs are one of the best lures you can carry in your tackle box when fishing for steelheads. They are available in a variety of colors, though many anglers state that chartreuse, pink and black are more effective than others. When using jigs, it is recommended that you use subtle colors on bright days with clear water and bright colors on dreary days with stained water. However, considering the behavior of steelheads this may not always be true. Thus, take this as more of a guide than a rule. When steelheads are out in the open water, they spend most of their time chasing baitfish, and they tend to carry this behavior even when they enter smaller bodies of water. This is why spoons make great lures for steelheads. Some anglers say that gold/orange and silver/blue color combinations are the more effective ones, while others say that solid golds work better for them. You may need to experiment and consider other factors (i.e. water color, color of baitfish in the area, etc.) in order to determine what works best for you. Minnows are some of the best baits for steelheads. Remember, baitfish comprise a huge portion of a steelhead’s diet for most of their lives, and that doesn’t change a bit when they enter the river or tributaries. The elusive and highly sought after steelhead is considered the greatest sport fish to chase in the world by many anglers. If you do not get a strike in a few casts, don’t give up. For the most part, steelhead fishing can be an exercise in patience, and every angler who has tried it knows this for a fact. Fishing for steelheads takes persistence, patience and confidence so keep your head down and fish hard. With the right knowledge and the right fishing gear and equipment, you’re bound to bag that magnificent steelhead that you’ve been dreaming about.